PortfolioKEEPER--the premier online portfolio tracking system geared specifically for direct investors like you--creates a relationship between company direct investment plan (DRIP) operations and your personal portfolio. With PortfolioKEEPER, you can manage your money effectively with next investment date information. You can decide how much to invest based on the suggestions of INVEST%--our specialized contrarian tool that suggests percentages of your predetermined investment amount depending the stock's 52-week high and low prices. PortfolioKEEPER enables you to manage without a broker. Indeed it enables you to take advantage of management options that are only available to DRIP investors. For example, PortfolioKEEPER accepts your direction to display only gains or losses. If you've made multiple purchases of a company stock, you might liquidate a portion of your holdings and, depending on your preference, recognize either a gain or a loss. 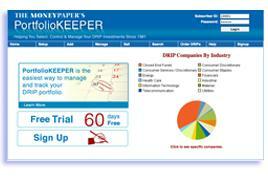 PortfolioKEEPER enhances your DRIP investment practice by eliminating time-consuming paperwork. You get instant access to your records and you can enter your non-DRIP holdings as well. Your entire investment portfolio is at your fingertips. With The Moneypaper Publications LLC PortfolioKEEPER, you are never alone in your investment decisions. Our account-management tool is designed to guide your day-to-day investment activity (including when and what to sell), provide recommendations, give you easy access to your history of investments, and allow you to review and print reports on the progress of your portfolio(s). PortfolioKEEPER is part of The Moneypaper Publications LLC suite of investment solutions--each of which plays an important role in your investment life cycle. For more information, or to subscribe, call 800-388-9993 or go to www.directinvesting.com.